This episode we bring you Mark Ehling’s searchlight to advertising, cola and anxiety. The essay “An Introduction to Slamz,” creates a surreally timed conversation that follows the expected patterns of advertising speak, finding the pangs available in the capsule of a “business narrative.” He takes on the form without abusing its excess of greed or tinheart stereotypes. Instead, he finds a cold portrait of the whimsy of consumption, and the fog of its navigation. It also explores why people smash cans on their heads. Please enjoy Mark Ehling. 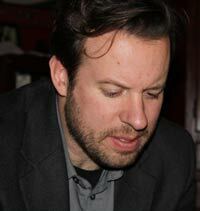 Visit Apostrophe Cast's blog for an interview with Mark Ehling.